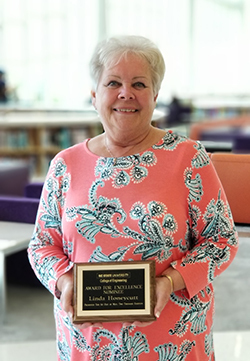 Linda Honeycutt, director of business administration in the NC State Computer Science Department, was recently recognized as the Department’s nominee for the College of Engineering 2018 Awards for Excellence. This year’s College of Engineering Award for Excellence winners were Susan Bernacki, of UNC/NC State Joint Department of Biomedical Engineering, Brenda Gainey, of the Department of Materials Science and Engineering, and Shannon Williams, of the Department of Electrical and Computer Engineering. The awards were announced at a ceremony held May 1st. Dr. Louis Martin-Vega, Dean of the College of Engineering, presented the winners with plaques and $250 gift checks. The winners also received eight hours of paid time off and are now nominees for the NC State University Award for Excellence.